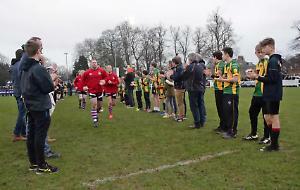 HENLEY Hawks head coach Luke Allen has made three changes for their first home game of the season against Barnes tomorrow (Saturday), kick-off 3pm. A new look front row will feature Ian Stock and Dave Manning at prop replacing Brad Cook and Rory Mason, who switch to the bench, highlighting the depth the Hawks find themselves in the front row this season. Elsewhere, Simon Perry comes in for Xavier Andre at centre who, picked up a knock during the Hawks against Bury St Edmunds last weekend in the opening fixture of the new National 2 South season. Allen says that even though they had started well, his side will be focused on putting in a good display. He said: “Despite Saturday’s excellent win, we have to be able to back that performance up and make sure we put in another solid display against Barnes. Barnes are newcomers to the league, having been promoted as champions of London and South East Premier League last term. However, they have played at this level before, for just one season in 2016-17 when they comfortably defeated the Hawks 36-14 at Barn Elms. Henley had their revenge later in the season, winning 18-16 at Dry Leas, which was part of a run of nine successive defeats for Barnes that eventually led to relegation. The Hawks will have to be at their best however, as the visitors have bounced back at the first attempt and started the season with an impressive bonus point 33-14 victory over London Irish Wild Geese. At Bury last week, Henley showed that they are street-wise in this league and were clinical in capitalising on the mistakes that the hosts made. The set-pieces went well, the new players made their mark while Joe Butler organised things from outside half in a man-of-the-match performance. Tom Hall will play his 100th game for the Hawks this week, an excellent club contribution from a fine, committed back row forward. Hawks squad: 1 Ian Stock, 2 Tom Emery, 3 Dave Manning, 4 David Hyde, 5 Jake Albon, 6 Sam Lunnon, 7 Tom Hall, 8 Marcus Lowe, 9 Leo Webb, 10 Joe Butler, 11 George Wood, 12 Simon Perry, 13 Connor Morrison, 14 Sam Portland, 15 Sam Randle, 16 Brad Cook, 17 Rory Mason, 18 Alex Bradley, 19 Ross MacDougal, 20 Jack Robinson, 21 Roddy Giles. On Sunday, Henley Hawks Women play their opening league fixture away at Abbey Nuns in the Women’s Championship South. The Henley Bulls, Vikings and Vultures sides have no scheduled fixtures.